It looks like the source of Aretha Franklin’s recent health issues is staying between the Queen of Soul and her doctors – Franklin said in an interview with Jet magazine that she’s keeping quiet. Indeed, as word spread that Franklin was having surgery for an unknown trouble in early December - a month after announcing that her concerts were canceled until May because of doctor’s orders - reports suggested that she had cancer, with the National Enquirer saying that Franklin had been diagnosed with inoperable and incurable pancreatic cancer over the summer. I don't think its right for people getting into others people business? If, Aretha wanted everyone to know she could have gotten on national Television and said what was wrong with her, and she should sue the person who leaked out her business, to teach them a lesson..
Mrs Franklin looks good and sound good, I hope you will make a come back so you can do tours again and you have a lot of fans in Colorado..wish you a speedy recovery..
Aretha needs a supersized wheel barrow to carry around that fat belly and mammaries. What a fat sow. My Gosh...you know after a big plate of chitlins, pickled pigs feet and watermelong Aretha could bring about her own shytstorm. Lord...doo doo pieces the size of footballs flying outa her rump. RUUUNN!!! Jesus loves you yes I know for the Bible tells me so. I thank him for blessing you with the voice to share with the world and until I'm dead and gone the memories of your heart felt songs that I grew up with will never ever be forgotten by my friends or family. Nothing but love for you sis and disreguard all the mean and hateful words that pour out of the mouths of the mean spirted ones for they too will have to account for their wrong doings on judgement day. Aretha knows not to speak of that mess. If you speak it you give it life. Life and death are in the power of the tongue. Sorry Mr. NO, your ignorance is showing. Aretha has never left the Church. And if your Jesus turns his back on anyone, you picked the wrong Jesus! God is good you are truley a blessing to the music industry..I will continue to pray for you.Get well soon QUEEN! I am sooo happy U are doing better...I love your music. As a child I grew up jammnig to your songs.Hope U continue to heal successfully and may God continue to bless you. Arnold. No. It's your god. They're your rules. YOU go to hell. You realize all the Fundamentalists will be on the sidelines in heaven, groaning and moaning over seeing all the pagans, etc happily enjoying themselves. The Fundamentalists will actually be in hell, and watching that will be their punishment. You see, god doesn't like it when people try to tell her what she thinks. Get well and God bless you, Aretha Franklin, Queen of Soul. 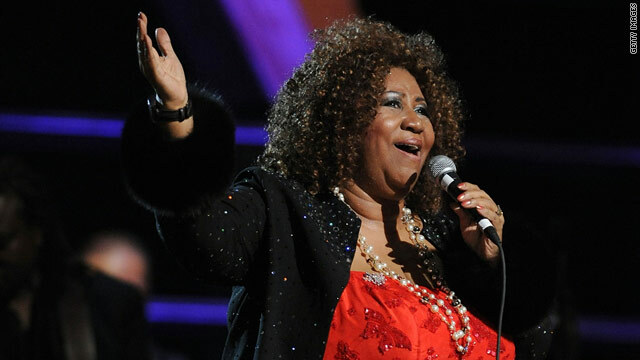 Greetings to Our Forever & Irreplaceable Queen of Soul! I have loved you and your music from the first time that I saw your early video singing "Respect" by the corner of the New York Stock Exchange! There is no one, absolutely nobody who will ever be able to take your place, Aretha. Know that all of your fans and all of America pray for your good health and a speedy recovery! Your amazing voice is a god-given gift, and I for one, am so thankful...Loved you and your hat at President Obama's inauguration- Please keep singing to us and for us, Aretha, we love you so! Get well. We need you here. Great blessings and much love. Unfortunately her unwillingness to simply dispel the rumour that she is fighting pancreatic cancer leads me to believe that it isn't a rumour. If it was false, then saying so wouldn't be discussing anything personal, as she doesn't personally have it. I wish her comfort and peace for her remaining months. All the best for a speedy recovery you are loved by all who love true talent. God bless the queen of soul.she has brought so much musical joy in my life whatever is ailing her i pray that she has a full recovery. I sent Aretha my signature moonshine. Fix'd her right up.